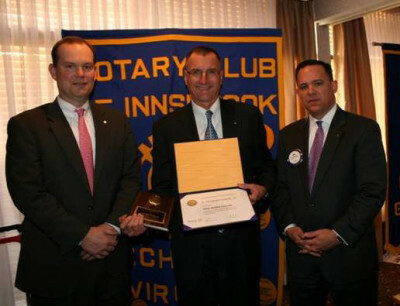 Congratulations to Mike Gracik, who was honored with the 2014 Innsbrook Rotary Business Leadership Award. Mike has been recognized for his outstanding leadership in business, commitment to high ethical standards, and dedication to the community. In honoring Mike with this distinction, his award included recognition as a Paul Harris Fellow of The Rotary Foundation. This is our 20th year of presenting this award, given to an individual who has made a significant contribution to the Innsbrook community through their business leadership and community involvement. Recipients exemplify the values of Rotary by actively and consistently demonstrating the true meaning of service above self. Mike Gracik, managing partner at Keiter, a large regional CPA firm here in Innsbrook oversees the firm's strategic direction and growth initiatives, as well as working with some of the firm's largest clients across various industries. Mike joined Keiter in 1991 and his clients benefit from his 38 years of professional experience and tax insights. Mike stated that “our tax system is a mess”. There has been a new tax bill every year for the past 30 years. He encouraged us to write our elected officials who need to provide legislation to fix the system.